This is the time of year where I can’t help but feel thankful. Thankful for health, happiness, harmony, bounty, and beauty, good friends and a loving family. I’ve always loved banners, especially ones created for birthdays or holidays. 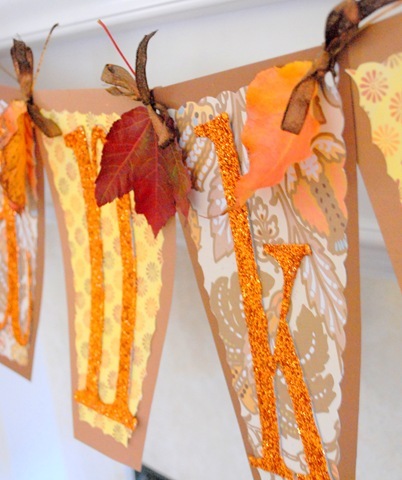 Yesterday, I gathered some simple craft supplies, and created my own banner to make a seasonal statement. I also added a few other seasonal touches to the living room to set the mood for Thanksgiving. This Thankful Banner is incredibly quick and easy to make, and a great rainy day afternoon activity to make with your kids or grandkids. Spread glue on top of chipboard letters, then dip letters in colored glitter and allow to dry. Next, cut your scrapbook papers in a shape just large enough to accommodate your chipboard letters. 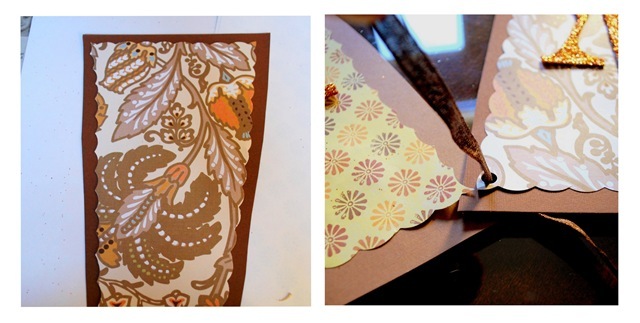 I used a brown background and a patterned piece on top, cut with scalloped scissors. Glue letters to individual pieces, and then attach with ribbon through a hole punched in the corners. 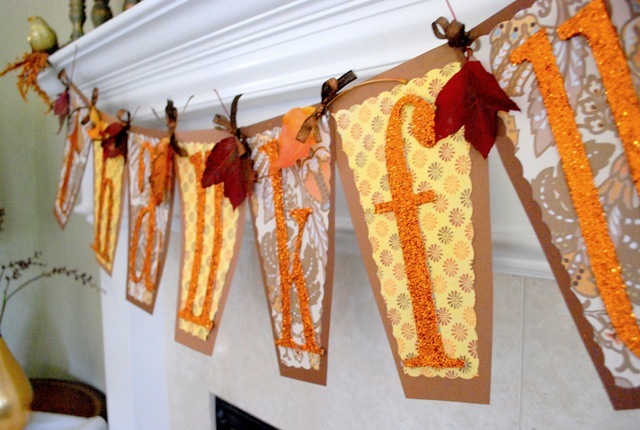 Add a leaf to each ribbon as you connect the letters, then tie with a bow. Display on your mantle or across a window. I’m pretending these two little golden birds are holding it up for me. 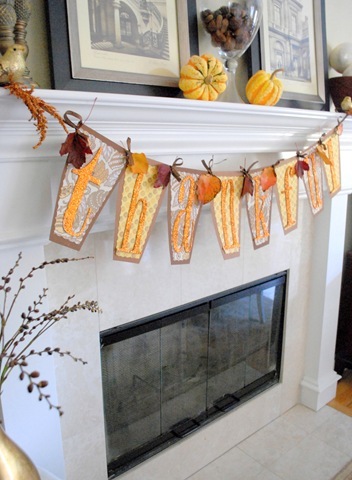 I never get tired of fall leaves – and I’ll use any excuse to decorate with them. I like to temper the warm tones of golds and oranges with a cool color like teal blue. Across the room, I added some turquoise to my thrift store sideboard display. 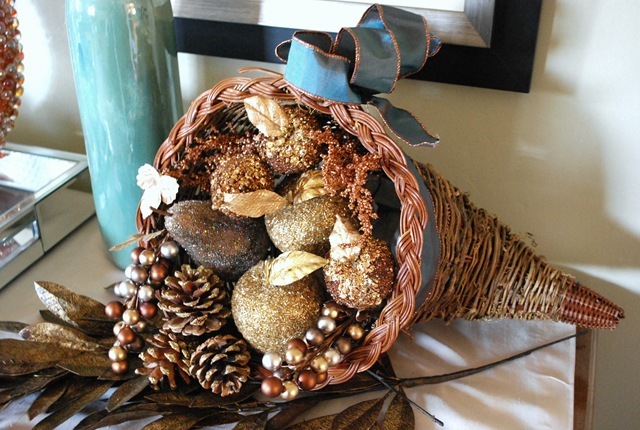 I’ve never been one to decorate with cornucopias before, but I was inspired this season to do so with some golden glittery fruits and pinecones. 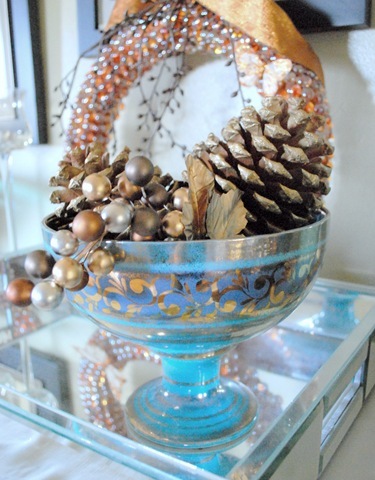 I am thankful that someone donated this turquoise and gold compote to a thrift store so I could bring it home for $5 dollars. One of my favorite things about welcoming winter is the abundance of citrus. 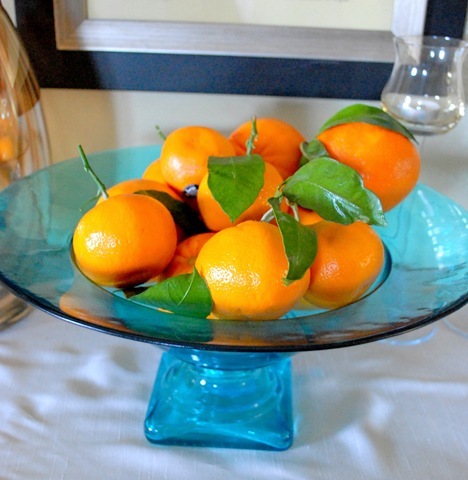 These oranges and mandarins just pop in the blue compote I found at Marshalls. How about you. What are you thankful for this season ? The banner is fantastic! It would be such a lovely project for my young cousins — and how my aunt and uncle would love to see them occupied for a bit! Love it all! The banner turned out so pretty and I love the turquoise with the orange. I’m thankful today for too many things to list but I would say that good health is one of the things at the top of my list today. SUPER cute banner. I’ve seen a lot of them, but this one is much cuter and makes me actually LIKE the thanksgiving banners! Another craft project I love!! Thanks for sharing! Well, thanks a lot! I’ve wanted a fireplace so badly and now I want one even more! =) This is absolutely adorable!! I LOVE it!! Kate, I made a thanksgiving banner today too! Yours is so cute and colorful. I used mostly brown tones on mine since I have a lot of orange and red on my mantle. I love the blues mixed in with the fall colors. I have never considered that but it makes perfect sense. As always, Kate, that is a beautiful display….I am mesmerized by the orange and turquoise combo. 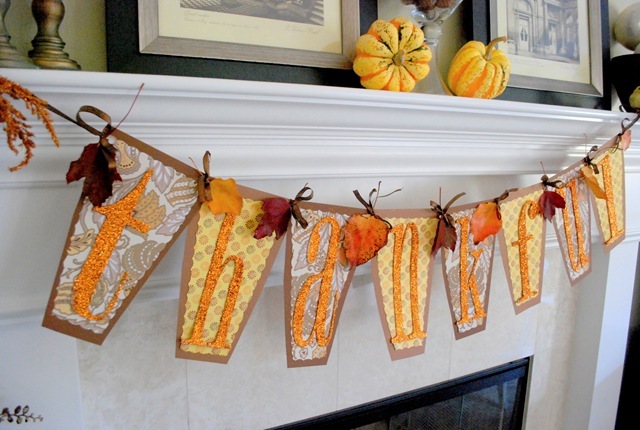 I LOVE the thankful banner…and hope you don’t mind if I steal….er…copy it from you. I love this banner!!!! The little birdies at the ends are the perfect touch. I’m going to have to look for the large chipboard letters next time I’m at Michael’s they are very cool. LOVE IT!!!!! Oh my gosh, I cannot wait to make this!!! Great idea for the mantel. We have a mantel that’s very similar. I’ll have to pass this along to my wife …. she may want to make something similar. BTW…I’ve been following your site on OPC…any chance you’d like to swap links or guest posts? I love that banner! Great decor. I need to beef mine up a bit – thanks for the inspiration!! The banner is gorgeous and the idea of adding turquoise touches is brilliant. I am so grateful not to have to spend another fall/winter/spring in the cold. I’m grateful everyday that I am here in this incredible state. I love the banner and have been looking for an excuse to use my growing glitter collection. I love sparkly things, so I love how you incorporate glitter. It’s always so classy and not overdone. I am thankful for my kids. My 16 yr old daughter has had a couple of close calls this year, and she is such a wonderful daughter – a true joy. First she nearly died before being diagnosed with ulcerative colitis this summer, and last month she was in a bus crash in Idaho on her way home from a marching band competition. Right now she is in Indianapolis competing in the Bands of America Nationals! I am also thankful for this sweet, uplifting blog. I enjoy following your day-to-day entries. I have SO much to be thankful for. So much. This is my favorite post in quite a while. I love the instructions for the banner. That’s super helpful for aspiring crafters like me :) Love, love, love your blues and oranges. I’m gonna copy ASAP! Your banner is stunning. Love the little birds. Oh my. I love it. I LOVE LOVE orange and turquoise used together! making my list to complete your banner with my daughter- she will love this- we are also hosting the thanksgiving dinner this year and this will give her a sense of contribution. thanks for sharing- loving the turq with the warm colors. I’m thankful that I still have my job and that my husband does too- that is such an immense blessing. I’m thankful for the friends that have really helped me feel like Greenville is finally my home. I’m thankful for the faith I’ve been blessed to have and the family that loves me unconditionally! SO much to be thankful for and I don’t take the time often enough, to remember that I have so much to thankful for. My daughter (age 6) is obsessed with the AmEx commercial showing the smilie faces out of everyday things. When I saw the first pic I immediately saw the banner as the mouth and the pumpkins as 2 eyes. Made me smile. Beautiful and classy…as always!!! – Thanks for asking this question because I needed some perspective today. My hubby hit a deer yesterday and totaled my car..yeah ..TOTALLED! Insurance is giving us a hard time and because of the stress we were at each others throats last night. Well, this morning I woke up in a ‘woo is me’ mood. But ya know, it is not THAT bad. He is OK our children are happy and healthy, we have a home and food on the table and more then we would ever need! It could have been A LOT worse! So, I am thankful all that I have!! I am one lucky chick!! Thank you, Kate! How darling! Just right for the mantle or over a doorway! that’s a really lovely project idea – I will def. bookmark and try it out! I just found your site about a month ago — and have been reading it ever since! I love your ideas. The cornucopia is done very well. Did you use foam inside or another medium to hold the fruit and pinecones together. 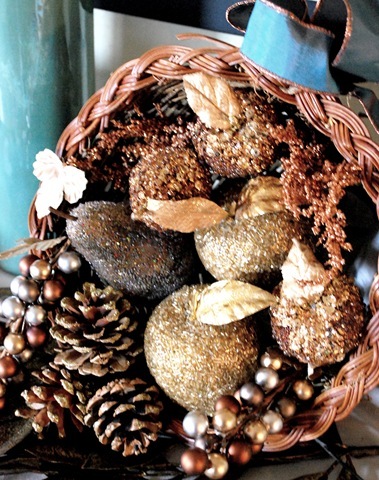 I have glittered fruit and pine cones — I think I’ll put one together. I haven’t used my cornucopia for YEARS as it is OLD and DATED. I just pulled everything out of it a few years ago, threw the stuff away and the cornucopia has been in storage ever since. Thanks for sharing your home and your ideas. Love the banner! There is a big mirror in our dining room that is calling out for one of these! Thanks for the inspiration. Wow, all of it..just gorgeous. I would have never thought to add in the turquoise, but it totally works! And the birds holding the banner? Love! Love this! I esp. love the glittered chipboard letters. I swoon for a little glitter. Thanks for joining in the dare to DIY challenge. Your entry is awesome! I love your banner, but most of all I love the little birdies holding it up– too cute! So pretty. I want a banner like that and the mantel to put it on!! I love that the banner has glittered letters, and the birds! Lovely! And I have a cornucopia too. It isn’t Thanksgiving without it. Love all that you have created! 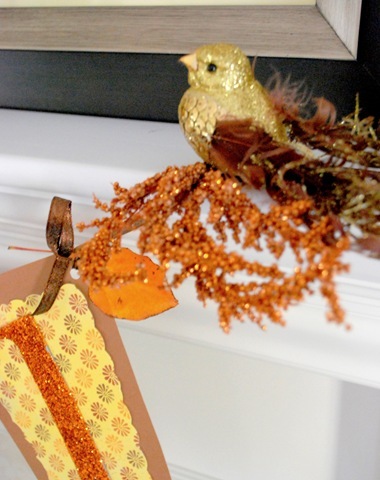 I love the Thankful banner w/ glittered letters, and that cute glittery bird. Love all your blue with the fall colors.. WHO NEW! Wow, your decorations are gorgeous! I’ll be linking, thanks so much for sharing all your wonderful ideas! I love your thankful banner! All of your decorations are beautiful. I especially love the sparkly birds. I love your banner! It is so colorful and festive! Great job! I’m thankful that I saw your pretty thankful items, and that I found your blog! Can’t wait to see what you have going on for Christmas! Happy Turkey Day! What a cute little banner. I love how the little birds are “holding” in up. It carries such a simple, yet important reminder to us all…to be thankful for all the many blessings we have in life. Thanks for sharing and Happy Thanksgiving. 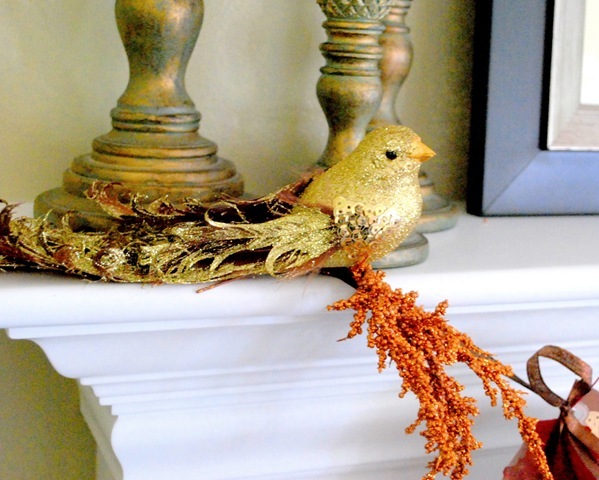 What a great and easy project and the little birds are perfect. I love, love it! 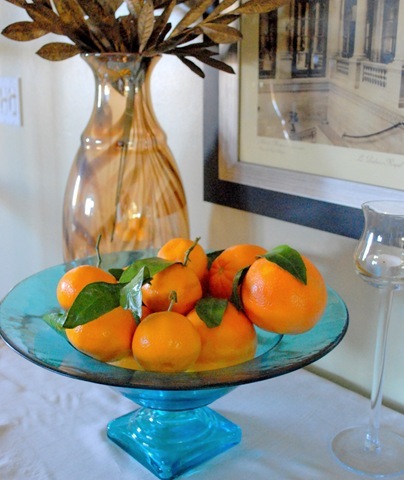 Your decorations are elegant and inspiring ….the blue is surprising with the oranges, but looks so good! Thank you so much for linking up to the Sharing Thanksgiving party!!! I wish you sold more of your crafts on your etsy store! i would love to own decorations like this, but I just don’t have the time at the moment… sigh. Sunday afternoon (Nov 15) my second oldest daughter turned 21, and she also left for Marine Boot Camp! 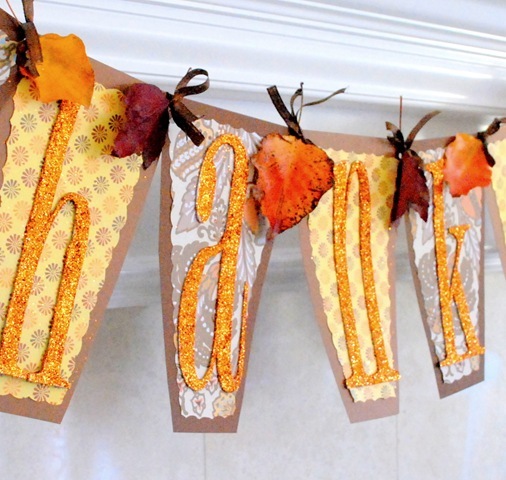 I spent the rest of the afternoon crafting your thankful banner. I free handed the letters, my colors didn’t turn out as great as yours, and I omitted the leaves and used raffia instead of ribbon. 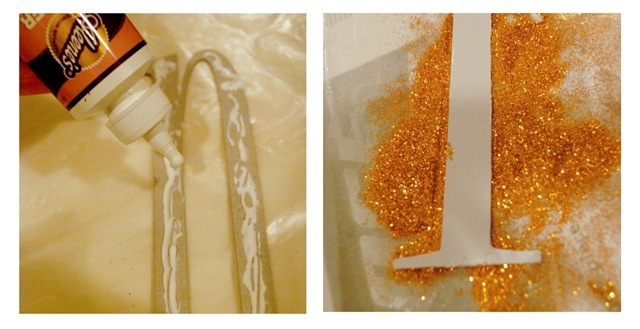 Basically I was using what I had on hand, except that I did buy orange ultrafine glitter. I was delightfully engrossed in this activity for hours, and while my color choices could be better, my banner gives me joy to look at. I should mention I am very inept at decorating, so it is odd that I even stumbled upon your blog. I must also say that the main thing that got me hooked on your blog is your writing style – I love to read everything you write! The wonderful side effect is that you’ve got my mind working on little improvements I can make around my home to beautify it. Thank you, Kate, for your inspiration, ideas, photos, and time! I am so hooked on these banners right now. You did a fabulous job! Thanks for sharing! Felicitaciones tus proyectos son hermosos y de muy buen gusto. Saludos desde Chile, Copiapo. I love this but cannot find these letters? what size did you use? I check Michael’s today but they didn’t have anything close to this. Thanks! So pretty, love your blog! Wowww you are so talented and creative!! I love this banner, it actually looks so professional :D And I will be coming back to your blog for ideas~it makes me a wee bit sad that somehow along the way, I have quenched the creative artist side in me, hehe. You just sparked it! I’m CONSIDERING to maybe use this tomorrow with the kids I volunteer for in the inner city. We’ll see!~;) Thank you. Oooh! I just bought my friend’s Cricut and this would be an awesome project to get started! I can picture one hanging from my mantle for Christmas! 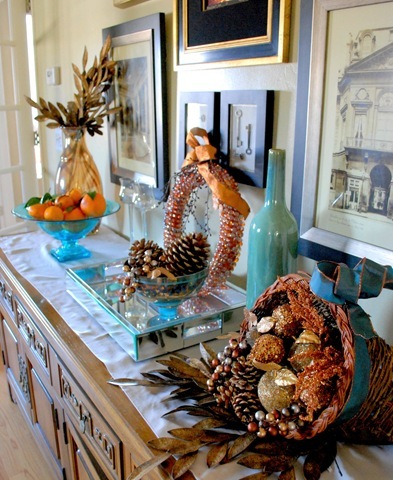 I am so excited to be featuring your blue decor and sideboard from this post on my blog today. I hope you will have a minute to pay me a visit.